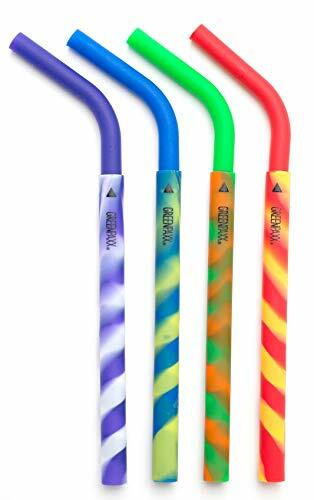 Never buy disposable straws again with GreenPaxx Reusable Silicone Straws. Whether it's Vitamix, Nutribullet, Magic Bullet or Ninja, if you use a blender, you're gonna love these straws! Our patented two piece design adjusts for tall tumblers as well as shorter shaker cups. Non toxic, BPA free silicone makes them a great alternative to plastic or stainless steel straws. Soft on teeth, dishwasher safe. Pair with a Cool Cap and a rocks glass for a non toxic alternative to plastic sippy cups. Unique fitness gift, health gift and even makes a great gift for seniors. Ages 3 and up. STRAWS and CAPS SOLD SEPARATELY. With every box purchased, GreenPaxx donates a portion of profits to Ocean Conservancy and The Plastic Pollution Coalition. These organizations help mitigate and educate on the effects of disposable plastic on our environment. Thank you not only for supporting our small business but for helping these organizations do great things.